Colostrum is the milk secreted by cows within the first 72 hours of calving. It contains essential nutrients for growth and development. Ripple Colostrum Milk Tablets is processed at low temperature to retain its natural and unique properties. It is an excellent nutritional supplement specially formulated for children, adults, elderly and athletes. 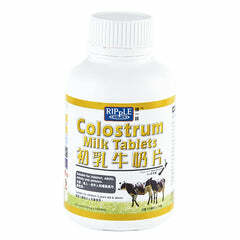 Colostrum Milk Tablets (milk product), vegetable oil, glucose, sodium caseinate, tri-calcium phosphate, maltodextrin. take 5 -10 tablets daily.